BMX Shop & Mailorder » News » BMX Shop News » Maxxis Tires - In stock! We got all Maxxis tires in stock, like for example the Maxxis "Grifter" BMX Tire, which is a super high pressure allround tire with low V-profile and available in 1.85"and 2.10". It has a high graded and durable rubber mixture and also offers you strong sidewalls at a low weight. Also now in stock, the Maxxis "DTH Kevlar" BMX Tire (foldable) is super-light to accelerate like no other BMX tire, yet holds up to the abuse you dish out. The dual-compound tread corners incomparably on hard-packed tracks and rolls fast on the straights. The Maxxis "DTH Kevlar" BMX Tire (foldable) is very light and foldable by the use of Kevlar instead of wire. With these features, it fits in any backpack and is perfect as a spare tire on the go. 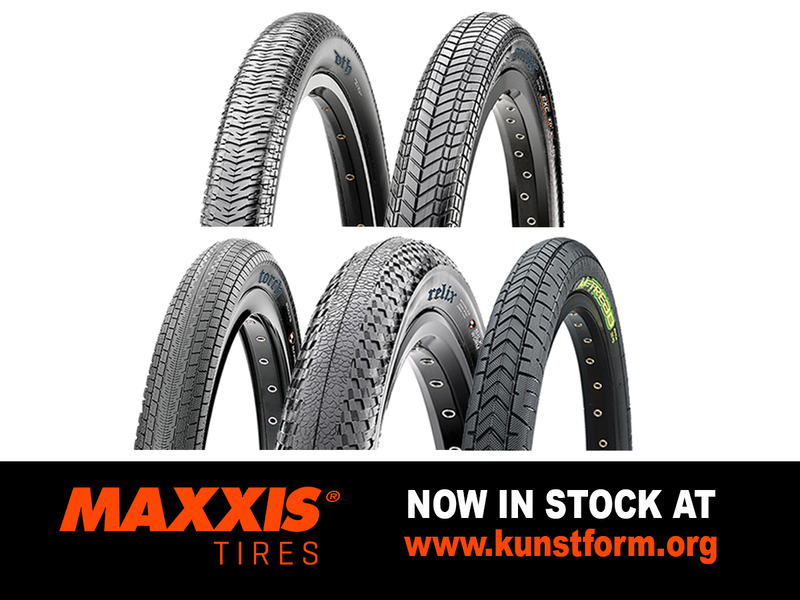 Check our online-shop for more new Maxxis products!